When Hanging a Door, How Much Room Do You Need for the Hinges & the Door to Close Properly? Fiberglass doors are quickly becoming a popular alternative to traditional wood entry doors. 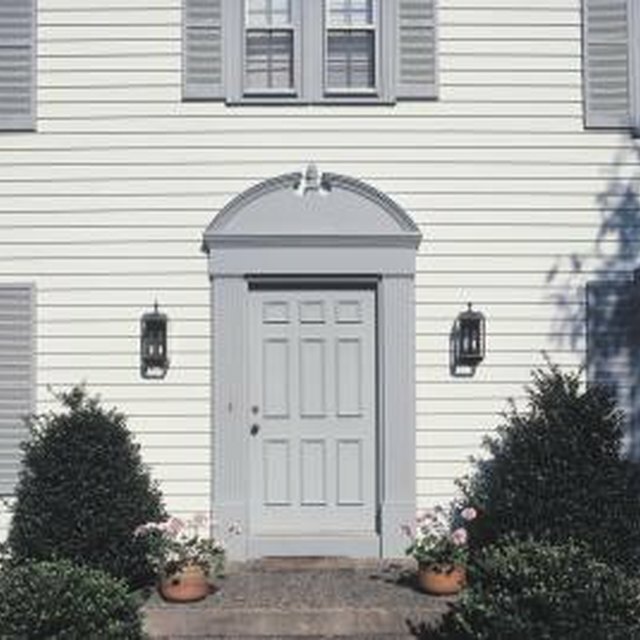 Some homeowners may find it difficult to choose between these materials, especially when these doors have so many similar characteristics. By examining the benefits and drawbacks of wood and fiberglass doors, you are more likely to choose the one that will best match your needs. Because fiberglass doors are a relatively new product, they are typically more expensive than wood doors. When you consider the cost of these doors over their lifetime, however, it becomes clear that fiberglass is the more cost-effective choice. Fiberglass can easily last for decades, while wood doors will need to be replaced several times over during the same time period. One of the primary benefits of fiberglass doors is their low maintenance requirement. These doors will not crack, warp, rot or swell due to humidity or moisture. Wood, on the other hand, is susceptible to moisture and temperature changes. Wood doors tends to swell or rot over time and are much more likely to suffer irreparable damage than the average fiberglass door. Wood doors are available in a wide variety of species and finishes. Fiberglass doors can be embossed to simulate real wood grain. This material looks so much like wood that it can be difficult to tell the difference, even up close. Both wood and fiberglass can be stained or painted, sanded and refinished as necessary. For some homeowners, the close resemblance between wood and fiberglass may not be enough. Some buyers feel that nothing quite matches the look and feel of real wood. This is particularly true when the door is being installed around a large area of wood trim or other wood features. Wood doors may have a solid or hollow core, which can greatly affect the door's level of security. Fiberglass is always solid and may consist of a full fiberglass core or some type of insulating material. Both wood and fiberglass doors are available in a wide variety of sizes and designs, with optional glass panels also available. While doors are nearly always painted or primed, a fiberglass door can be left unfinished without fear of damage. Some fiberglass doors even have integral color throughout the entire thickness that can provide a low maintenance finish option for homeowners. Most wood doors are fairly easy to install, even for DIY homeowners. They can be cut, prepped, planed or shimmed to allow them to fit into almost any frame or opening. Fiberglass doors are more difficult to work with. They must be ordered based on the exact size requirements and cannot be sanded or planed down to make them fit in an improperly measured or aligned frame. Fiberglass can also be more difficult to cut when adding deadbolts or hardware.